On our last day in Breckenridge, we climbed the highest mountain of our trip - Hoosier Pass on the Continental Divide in Summit County at 11,542 feet. It was the most difficult hike/climb of the trip, but so worth it for the views! We definitely experienced "Type II Fun," which is an activity that you don't enjoy doing in the moment (like literally climbing a mountain!) but you look back and say, "That was fun!" Taking a little time to breathe at the Hoosier Pass trailhead. We went on to Boulder for the next two days. Whenever Hoyoung and I go on trips, we crave Asian food. 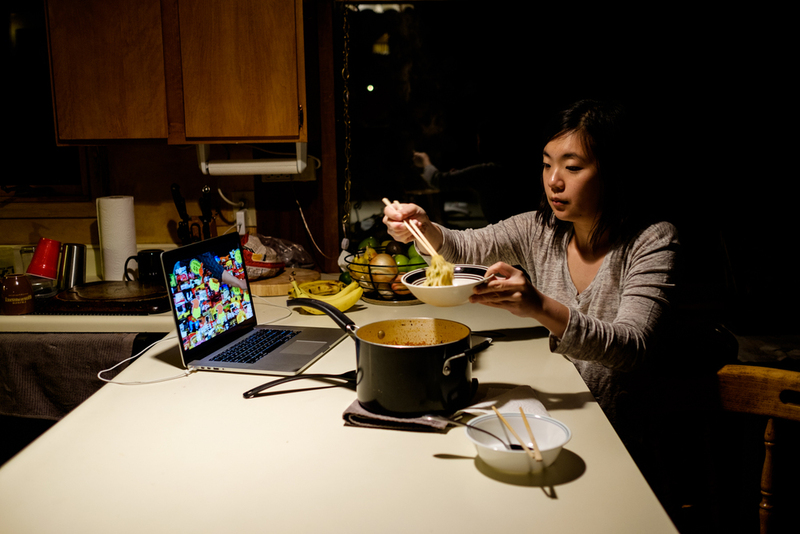 We curbed our craving for it on our first night in Breckenridge with Korean instant ramen. Dishing out noodles and catching up on some Korean shows in our AirBnb cabin in Breckenridge. For our first night in Boulder, we curbed our craving with Tibetan food at Tibet Kitchen. This unassuming little place had a constant flow of hungry customers in and out of the restaurant. We barely found a place to sit - we were resolved to eat standing at the counter if it came down to it. The bold flavors and hearty portions were amazing! With our stomachs full and warm, we definitely had a good night's rest! The next day, we had a chance to meet up with our new friend, John Dale. He is a very talented adventure photographer and filmmaker! You can check him out here: http://www.johndale.co. He took us to Mount Sanitas Trail for a hike. Hoosier Pass was the most physically challenging hike and Mount Sanitas was the most mentally challenging! Looking down while walking across a large pile of boulders on a downward slope is not a good idea! I had to take a deep breath and muster up courage to walk across these rocks! I never knew I was so afraid of heights until this trail. John, who loves to climb, showed us some of his moves! John climbed a tree for us and literally went out on a limb! Thanks for hanging out with us, John! Colorado taught Hoyoung and I a lot about what it means to travel and rest well. We didn't do anything particularly exciting or extraordinary while we were in Colorado but we did do a lot of stopping, looking, and enjoying. Although one of Hoyoung's ways of stopping, looking, and enjoying is to take photographs, I often find myself snapping away on my iPhone just for the sake of taking photos. I tell myself, "I'll look at these photos when I get back and draw from them then" - of course, this never happens. Also, I'm not really even seeing what's around me because I'm too busy trying to get the perfect Instagram post. This time, I decided that I needed to stop and actually use the sketchbook and pencil I brought with me instead of leaving it in my suitcase. It made such a difference - I wasn't standing around wishing I had something to draw the beauty in front of me but I actually could! Most importantly, it forced me to slow down. This was the first trip that I came back feeling refreshed instead of tired and knowing I had traveled well. 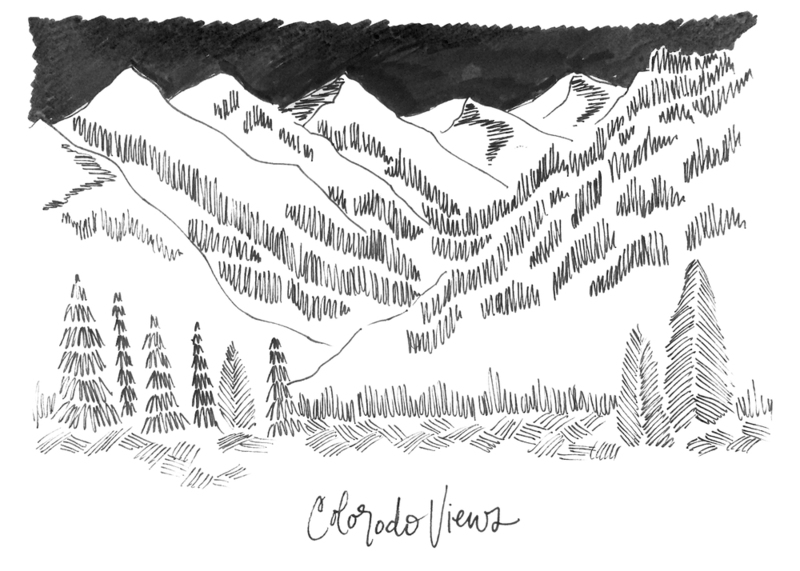 Being able to slow down and take a step back to observe the beautiful scenery that surrounded us in Colorado also helped me to step back and observe the chaotic life Hoyoung and I had created for ourselves at home. Colorado taught me that our pace of life has been too fast, our schedules too tightly packed, and our plates too full. Whether we're traveling or going through our normal day-to-day, I saw that we had been over-stretching and over-extending ourselves with work, serving, and people around us. Since we've been back, Hoyoung and I have been actively taking steps to pare back the busyness and to be intentional with the people we love. We have made some practical changes. We are now eating more meals at home, just the two of us in the quiet of our dining room, instead of going out to restaurants. We marked our calendars for Saturday mornings we can go hiking locally because we both find it refreshing; our favorite trails are in Cedar Hill. We also reduced expenses in the areas where we were spending in excess. It is amazing how much financial stress this relieved, and it freed up our budget to invest monetarily in the areas that matter to us instead of spending money to spend it! These simple things have allowed us to truly rest after a long day of work or a long week, a long month, of work. Colorado will always have a special place in my heart because it taught us how to truly travel and rest well. How do you travel and/or rest well? Leave a comment below and join in on the conversation! All photos were taken with a Fuji X-T1 camera. Last week, we went to Colorado for a wedding and stayed a little longer to rest. We had a wonderful time breathing in the fresh air, taking in all of the beautiful views, and enjoying the cooler weather. We received the invitation for the wedding of our friends, Mark and Kira, at the beginning of this year. We had a hard time making the commitment to attend. In some ways, being a freelancer makes it easier for us to pack up and go out of town; in other ways, it makes it harder because if we don't work, we don't make money. I never thought of PTO as being a luxury until I gave it up. Two weeks before the wedding, we decided to go - Mark and Kira graciously let us RSVP last minute! - and we are so glad we did. This trip reminded us why we quit our 9-5 jobs to be freelance creatives, why we are freelance creatives together. A selfie at the wedding. Hanging out with our new friends, Sean and Natalya, in downtown Golden. They were so generous for letting us stay with them Friday night for the Saturday morning wedding. After the wedding, we drove on US Highway 6 from Golden, CO to Breckenridge. It was foggy during our drive, eerily beautiful - we could not help but stop on the side of the road. What should have taken us just under an hour from Golden to Breckenridge took us almost two because we took the time to look, stop, and soak it all in. US Highway 6, on the way from Golden, CO to Breckenridge, along Clear Creek. 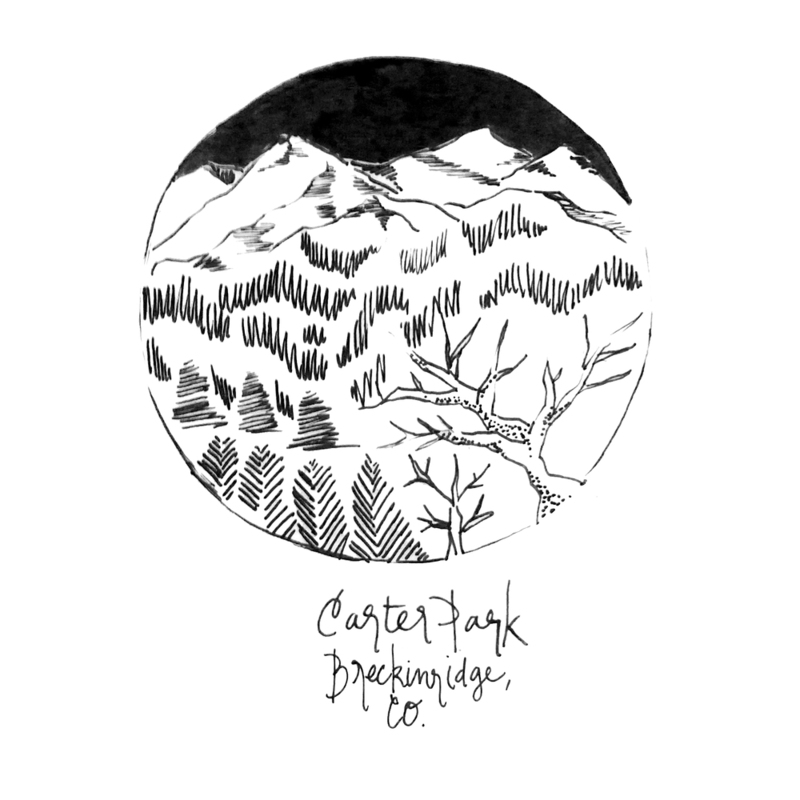 Our time in Breckenridge was spent hiking, eating, drinking good craft beer, and sleeping. It was so nice to get away from the noise of a big city - even the Airbnb cabin we stayed at was tucked away from the road, peaceful and surrounded by lots of big trees. The view from the window of our Airbnb cabin's den. Our first hike on our first full day in Breckenridge was at Carter Park. It was tough to breathe not being used to the high elevation, but the views were beautiful. Hoyoung took lots of photos of the scenery, we took portraits of each other, and we purposely made stops so that I could sit and draw. We set up Hoyoung's Fuji X-T1 on a GorillaPod, clinging to rocks, to take this. I look way more nervous in this photo than Hoyoung! After the hike and a quick shower, we explored Main Street and had some delicious burgers and brews. Main Street in the town of Breckenridge, CO.
Good eats and good beer at Breckenridge Brewery & Pub. We went back to our cabin to take naps - yes, naps! Later, we drove out on to Highway 91. By mistake, we drove through the Copper Mountain Ski Resort, but we found our way back out to this gorgeous view. These shots Hoyoung got are my favorite from our trip. 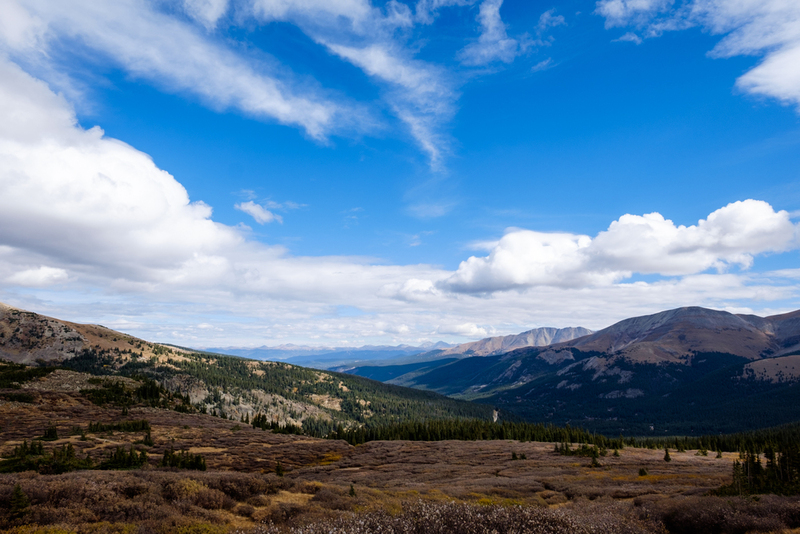 A majestic view at the foot of Copper Mountain. Another view of Copper Mountain from the highway. Breckenridge allowed us to slow down the fast-paced life we are used to living in the city of Dallas. The last couple of trips we've been on, most recently New Orleans, Chicago, and New York, have been to big cities. This trip reminded me that our lives are so short compared to eternity, that time can go by quickly and will move past us if we let it. I am so grateful to have had the time to re-learn how to slow down in Colorado.